Review of Finnriver Fire Barrel. I’ve tried the previous version of this (see here) as well as this new version on tap (see here), but now I’m reviewing a new bottle in more detail. I’ve also tried most of Finnriver’s lineup (see here). Availability: Limited release. Finnriver ciders are sold in WA, OR, CA, AZ, NV, TX, IL, CO, and Alberta & BC Canada (detailed info here). They also have an online store (which can ship to WA, OR, CA, AK, CO, MN, FL, & WA D.C.), but I didn’t see this one at the time of review. Cider Description: A robust, bold and balanced taste of traditional cider apples— with a whisper of whiskey and rye spice; smoky aromas; notes of caramel and vanilla; and a mature, tannic finish. 100% Finnriver orchard organic cider apples: Chisel Jersey, Brown Snout, Harry Master’s Jersey, Medaille d’Or, Frequin rouge, Dabinette & Major. Carefully farmcrafted and fermented with a blend of homegrown Finnriver orchard organic cider apples and white wine yeast in stainless steel tanks. Once the fermentation is complete, we cask the cider in Washington rye whiskey barrels for 5 months to impart depth and character. This award-winning cider was inspired by PNW cidermaker Drew Zimmerman, whose mentorship and cider apple trees helped us establish our orchard. After chilling, allow the cider to warm slightly and serve; we favor Fire Barrel in a Belgian-style tulip glass. Try it with roasted pork, slow roasted brisket, a blue cheese burger, cured meats, smoked cheeses or any other hearty, savory fare. Caramelize an onion with Firebarrel cider and add to a dish for a feisty meal. Cidery Description: At Finnriver we gather and ferment the flavors of the land to offer you farmcrafted hard ciders and spirited fruit wines. We are inspired by the allure of the fruit, the ancient history of the craft of fermentation and the lively traditions we now seek to revive. Our mission is to inspire a deeper connection to the land that sustains us….Some of these ciders are small-batch, seasonal and labor-intensive. Others are produced with contemporary methods and more readily available year-round…Finnriver grows over twenty varieties of traditional and heirloom apples in our organic orchard, to feature in our traditional and specialty ciders. Finnriver has a great illustrated product guide (see here). They have a tasting room and are on the Olympic Pennsylvania cider route, along with the Eaglemount and Alpenfire cideries. How Found: My husband got this for me for Christmas! He didn’t know I had already tried this new release, but had remembered me loving the old one. First Impression: Light caramel amber hue. Nearly still. Smells of cider apples, caramel, and bourbon. Tasting Notes: Semi-dry. Very light bodied. Low tartness and acidity. Low to moderate bitterness and tannins. No sourness or funk. Notes of bittersweet cider apples, caramel, brown sugar, leather, orange, bourbon, smoke, and oak. Long bitter finish. Moderate apple flavor and flavor intensity. Low barrel influence and sessionability. Low to moderate bourbon influence. Moderate to high complexity. Opinion: I enjoyed it. However, compared to the old release, this is a disappointment. The price is significantly higher, it is drier, less flavorful, more bitter, and thinner bodied. I agree to serve this at cellar temperature (between fridge & room temp), as colder would mute the flavor. I even enjoy ciders of this style at room temperature. Most Similar to: Other ciders from bittersweet cider apples. This reminds me of English cider, but with the added bourbon and oak. Closing Notes: I am curious about next year’s release, and if it will be more like the previous version that I absolutely love. 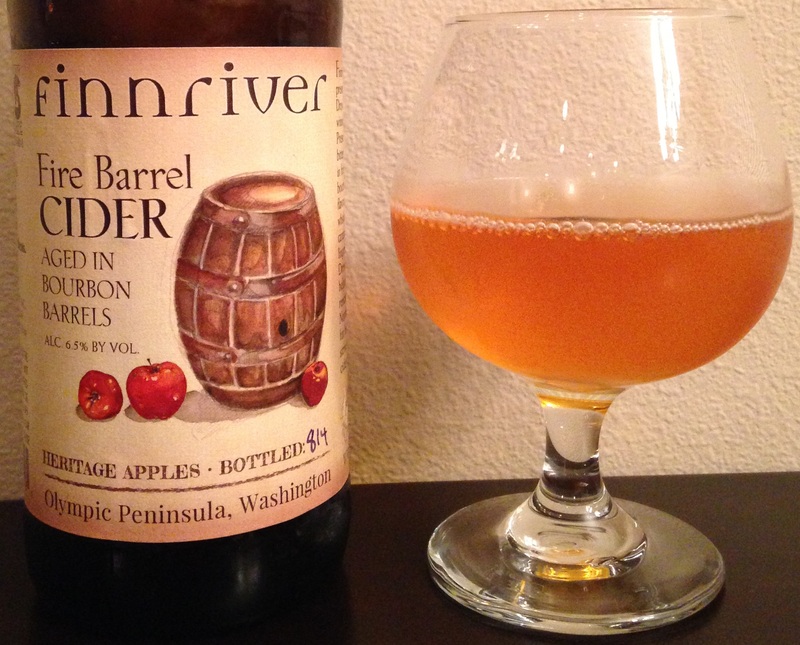 Have you tried Finnriver Fire Barrel? What did you think? Review of Finnriver Fire Barrel. I’ve tried probably 10 other Finnriver ciders. Here is a great illustrated Finnriver product guide. Cider Description: Finnriver is honored to present master cidermaker Drew Zimemrman’s award-winning Fire Barrel cider. Pressed from traditional bittersweet apples and aged in fire charred Kentucky bourbon barrels, this full-flavored cider offers a hint of whiskey, oak aroma, notes of caramel and vanilla, a lingering soft tannin finish. Drew’s passion for cider helped ignite the cider renaissance in the Pacific Northwest and now, here at Finnriver, we are grateful for his mentorship as we strive to carry on a rooted cider tradition. Made with a seasonal blend of heirloom and traditional cider apples. The label has “814” handwritten after “Bottled:”…it looks like this may indicate a bottling date of August 2014, although I only bought this a few months ago. Cidery Description: At Finnriver we gather and ferment the flavors of the land to offer you farmcrafted hard ciders and spirited fruit wines. We are inspired by the allure of the fruit, the ancient history of the craft of fermentation and the lively traditions we now seek to revive. Our mission is to inspire a deeper connection to the land that sustains us….Some of these ciders are small-batch, seasonal and labor-intensive. Others are produced with contemporary methods and more readily available year-round…Finnriver grows over twenty varieties of traditional and heirloom apples in our organic orchard, to feature in our traditional and specialty ciders. They have a tasting room open seven days a week, noon to 5pm, and are on the Olympic Pennsylvania cider route along with Eaglemount and Alpenfire cideries. How Found: Browsing. I tried this a couple years ago and didn’t like it oddly enough. Then I had it again at a Capitol Cider tasting with Bill Bradshaw and nine WA cideries (notes here) and really enjoyed it. I imagine my tastes had changed since the first time I tried it, as then although I enjoyed barrel aged, I wasn’t into higher tannin ciders. I had actually bought the bottle before the tasting, as I wanted to give it another try now that this type of cider is my favorite. First Impression: Orange-amber hue. A few large bubbles at the edge of the glass but otherwise still. Smells like ripe apples, tannins, oak, vanilla, spice, and rum?. Opinion: Semi-dry. Ripe apple, caramelized sugar, bourbon, oak, earth, smoke, and vanilla notes. Lovely bittersweet apple flavor. Although I picked up rum oddly enough in the scent (probably as I got a hint of spice), the flavor is more bourbon/whiskey, and I don’t pick up any spice. Moderate to heavy tannins. Low acidity. Low bitterness. Low tartness. Very light funk (more earthiness than anything else). Mild to moderate barrel influence. Mild to moderate spirit influence. Pretty much still (no carbonation). Medium bodied. Moderate to long finish. It start off with the tannins, then mellows out quite a bit. Most Similar to: Other tannin-forward ciders. This reminds me of English style cider, but there is the added nice barrel & spirit flavor. Closing Notes: Awesome! 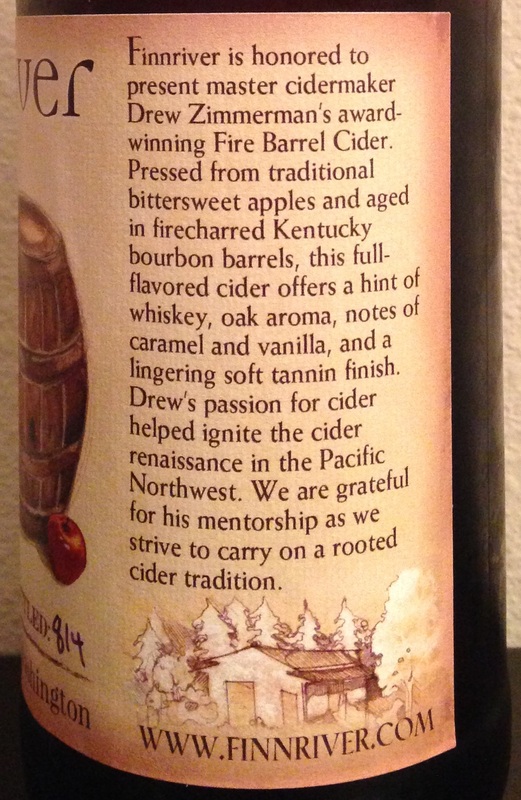 I really enjoyed this cider–one of my favorites, and definitely my kind of cider. Bold and unique. It definitely isn’t an introductory type cider (although still less harsh than for example Sea Cider Prohibition / Rumrunner and Alpenfire Smoke, which I also really enjoy), but is a great example of what can be made when you use cider apples and barrel age.